As originally proposed here, let's spice up the map with more Dwarrows! Namely, Dwarves in the Copper Mountains (Atlas Mountains equivalent). 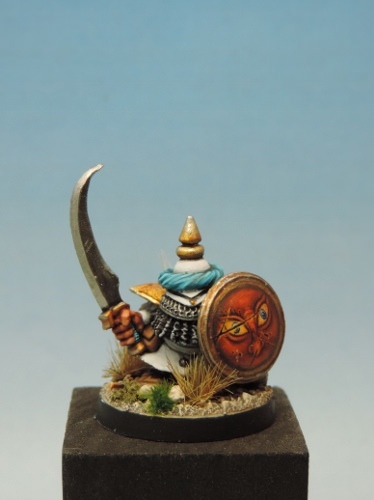 Not Vetian Dwarves, but descending from ancient Infernal Dwarf colonists fleeing ravages during gone ages and seeking wealth, who settled in the distant Copper Mountains and lost close contact with their eastern kin in the following ages of chaos. 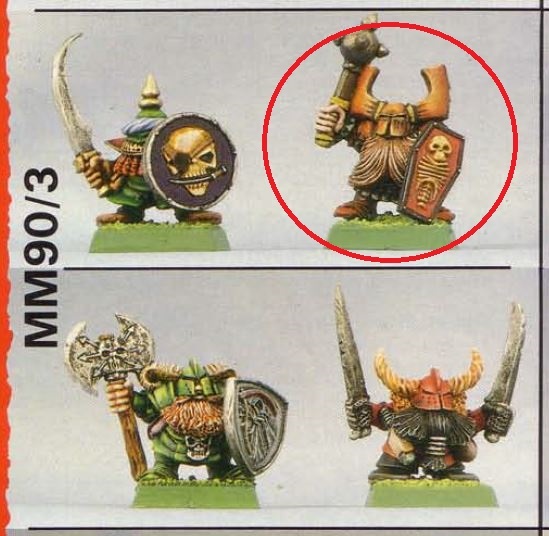 During these eras of war, the Infernal Dwarf main body to the east turned toward heinous methods to survive and even prosper in a vicious world of savage hordes and marauding tribes battering their fortified cities: They started to enslave Daemons and mortals alike, dabbling in forbidden arts and pursuing power at any cost. Power to survive, to fight back, to dominate those who once beset them with superior force. Not so the westerly cousins of the Infernal Dwarves, who developed in isolation and claims to have never turned to arts Daemonic. While a Dwarven folk apart from Gavemites, Vetians and Northern Dwarves alike, the mysterious Nekoshim have also become a tribe separate from their original kinsmen in the Infernal east, an uncorrupted branch of the benighted Infernal Dwarf tree. How does their culture look like? Any defining characteristics? Would a potential Nekoshim army list variant sport any unique things? Got ideas of your own? Please share! The southwest could be more rowdy, with only some Holds occassionally swearing allegiance to Al-Hisn (when forced or when it suits them), but mainly staying independent or acting independently under Amharaq's umbrella. Conflicts over land and water with local human highlanders and towns repeatedly flare up in the southwest, breaking an uneasy peace of occasional raiding. Copper Mountain Holds as a whole are not a united force with anything resembling a confederation, but a scattering of mainly subterranean settlements cleaving to their own interests and doing what it takes to survive and prosper. 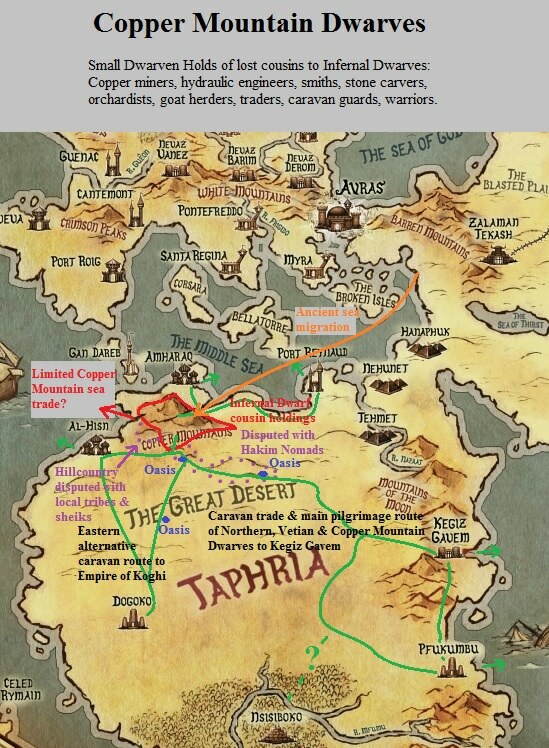 However, a gaggle of southeasterly Holds share a long-standing alliance against incursions from Hakim Nomads (dwelling on the desert frontier of the Copper Mountains), and will often unite their forces to exert control over key points along the eastern caravan route through the Great Desert, leading on to fabled Kegiz Gavem. Fortified oasis towns with date palms serve as resupply points for desert-trekking caravans, yet rule over the oasis towns have shifted many times from Nekoshim to Human hands. These towns sport a predominantly Human population, yet often with Copper Dwarven garrisons and overlords. The post was edited 10 times, last by Karak Norn Clansman ( Apr 2nd 2019, 9:57pm ). Clearly, we would need a better name than the working-name "Copper Dwarves". Something like Kananim? I think it is what the Carthaginians called themselves. Nechashim perhaps? Nechash is Copper or Bronze in Hebrew? Nekhoshet is copper in Hebrew. If there is a hold with a deep harbor at the end of the orange arrow showing the ancient sea migration, and that hold is linked via an underground steel road to a similar hold at the beginning of the red arrow, then there is a interesting way around Gan Darebs control of the trade between the Middle Sea and the Great Ocean. It does not even need to be a steel road but could be an underground canal for cargo barges. Must of the holds could be linked i such a fashion creating a rather safe network for the dwarves. Given that the land route from Kegiz Gavem is relatively safe the Dwarves of the Copper mountains could be the middle hand in trade between Virentia, Vetia and Kegiz Gavem. 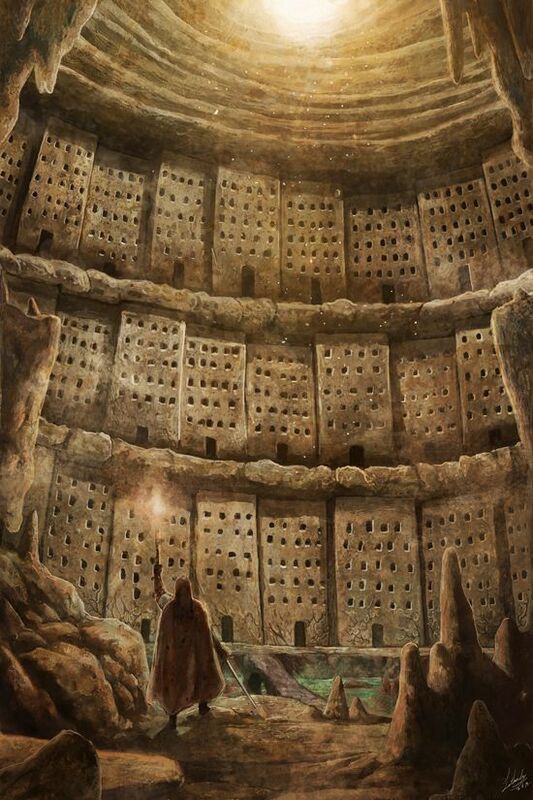 The trade would be rather small and go unnoticed by the Highborn Elves yet large enough for the Copper Mountains and Kegiz Gavem to be a lucrative network to maintain. Carthage in the original was « Kart-Hadasht », as far as I recall. 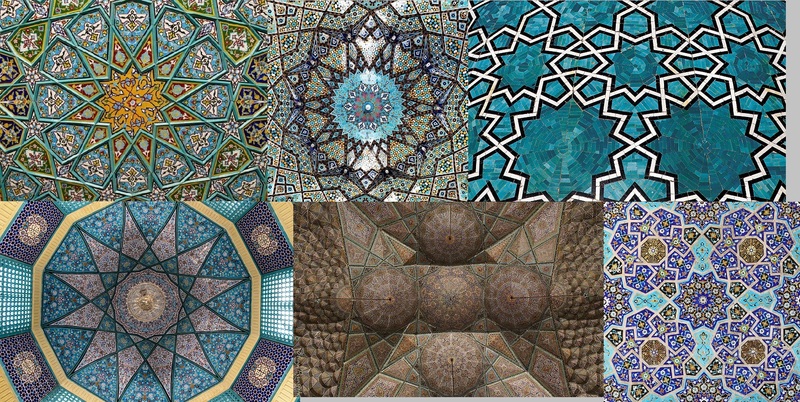 Qart-Hadasht, yep. Let's run with "Nekoshim" for a working name. 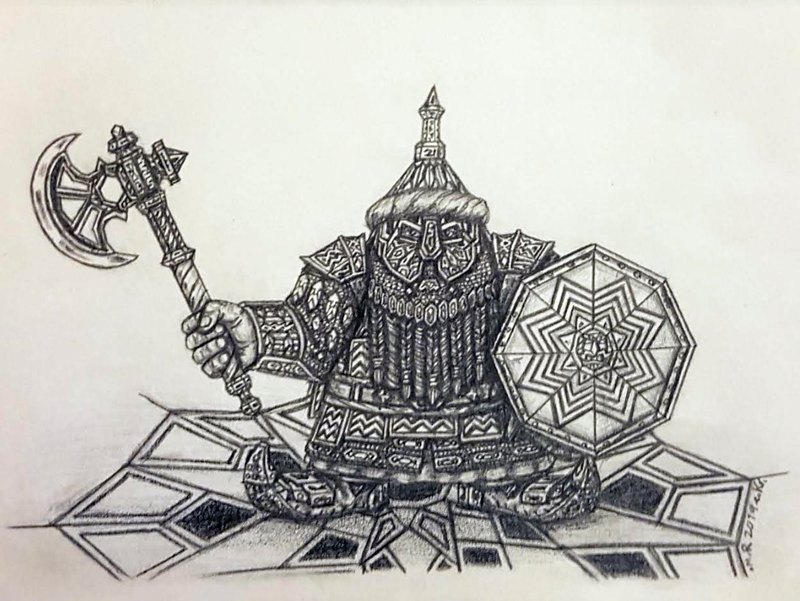 DracarysDrekkar7 over on Deviantart has kindly illustrated a Nabatean fantasy Dwarf of the Copper Mountains for the Ninth Age. 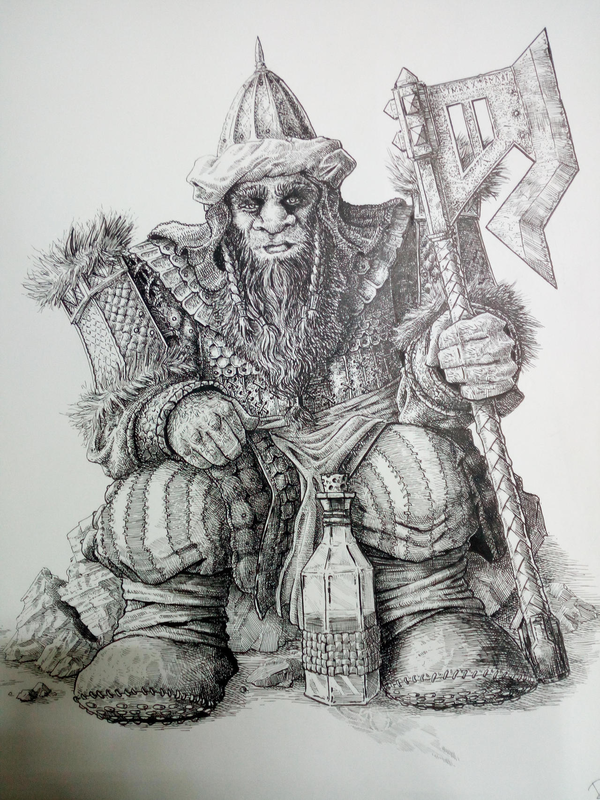 This great artist has a deft hand at illustrating fantasy, capturing both an impression of rugged life and craft refinement in fine detail. Check out his Deviantart gallery and be more than welcome to leave him a comment! The post was edited 1 time, last by Karak Norn Clansman ( Apr 2nd 2019, 10:54am ). The post was edited 2 times, last by Karak Norn Clansman ( Apr 2nd 2019, 9:56pm ). 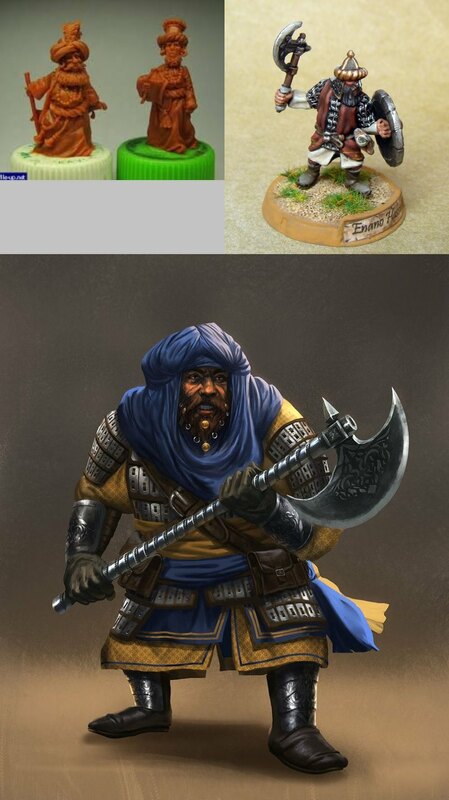 Sabious' Crafts - Painting, terrain, etc.